On September 3, 2018, the EMA approved the single domain antibody (sdAb) drug Cablivi (Caplacizumab) in Sanofi for the treatment of adult-acquired Thrombotic Thrombocytopenic Purpura (aTTP). Cablivi became the first specific aTTP treatment and the first marketed sdAb drug. In addition, the FDA has granted Caplacizumab priority review designation with a target action date of February 6, 2019. According to analysts, the drug sales peak will reach $400 million. Sanofi has a lot of layouts in the biopharmaceutical field, but it is also full of ups and downs. Considering the expiration of the patent for insulin glargine, Sanofi tried to acquire Mankind’s inhaled insulin, resulting in poor sales. A $4.2 billion agreement was reached with Hanmi on long-acting GLP-1 (Fc conjugation), and it soon shrank sharply. In the field of antibodies, Sanofi achieved cooperation with Regeneron Pharmaceuticals for a long time. Despite the successful launch of the PCSK9 antibody Praluent, IL-4/IL-13 antibody Dupixent and IL-6R antibody Kevzara have been launched, it is the biggest failure to miss Eylea. But Sanofi still hopes to make a difference in the antibody field. In January 2018, Sanofi bought Ablynx, a sdAb giant biotechnology company, for 3.9 billion euros. Caplacizumab is exactly part of the Ablynx product line. In 1993, scientists first discovered single-chain antibodies; in 2001, Ablynx was established in Belgium; in 2007, the first sdAb entered clinical research; in 2018, the first sdAb Caplacizumab was approved for marketing in the European Union. Single domain antibodies are characterized by a small molecular weight despite its short half-life. For example, the PD-L1 antibody KN035 uses Fc fusion to prolong the half-life. Ablynx’s Single domain antibodies use different strategies to fuse sdAb drugs to another anti-albumin sdAb that binds to albumin in the blood to extend half-life. However, Caplacizumab connects two anti-vWF Single domain antibodies by a 3 * Ala (AAA) linker. The combination of Caplacizumab and vWF can extend its half-life. The half-life of Caplacizumab is 10-30h that is comparable to the reported Vwf (the excessive drug is cleared with glomerular filtration when some drugs binding to vWF), which also proves its mechanism of action from one side. Acquired thrombotic thrombocytopenic purpura obtained TTP) results from lack of ADAMTS13 activity, which leads to the formation of platelets vWF- polymer, causing tissue ischemia and end organ damage. Prior to Caplacizumab, there is no specific therapy for aTTP and plasma exchange or immunosuppressive agents is the only way to relieve aTTP, in which a mortality rate of 10-20% still happens, and it’s more likely to have treatment tolerance and rapid disease progress after stopping plasma exchange. 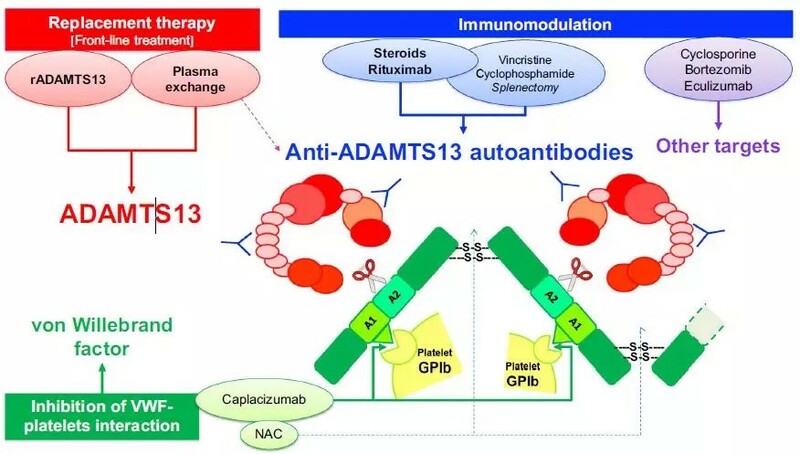 The specific TTP treatment is to prevent the formation of micro-platelet thrombus, of which ADAMTS13, ADAMTS13 antibody and vWF are major research targets. Now vWF firstly makes a breakthrough and is clinically proven for marketing. Caplacizumab binds to the A1 domain of vWF, which prevents the formation of platelet strings and is the first specific therapy for aTTP. 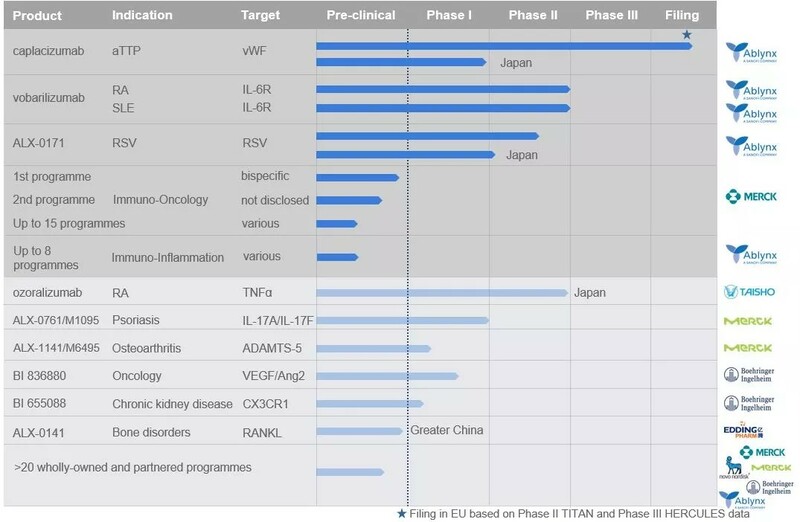 The approval of Caplacizumabo is based primarily on Phase II clinical trial TITAN and Phase III clinical trial HERCULES. The first dose is administered intravenously, and the subsequent dose is administered subcutaneously. The frequency and dose of the injection is once daily, 10 mg each time. The primary endpoint of HERCULES is the time to restore normal platelet activity. The combined detection of aTTP-related death, aTTP, and/or major thromboembolic events also decreases by 74% compared with placebo.